How much Level of Detail is really necessary in racing games? First of all: I am not a console guy, nor am I one of the 9Gag populating "PC Master Race!! !1!11" trolls. I just prefer PC gaming for various reasons, modding being the prime example (more on that in another article). But what I really enjoyed is the battle between Gran Turismo and Forza. Both franchises had to improve and deliver new, better content to keep ahead, the PC Modding community profited and I could watch the game unfold from the sideline. One of the positive attributes I associated with the Gran Turismo series was the immense amount of cars. Sure, there were and are about 40³ x Pi variations of the R34 Skyline, but still, 700 cars ranging from the first Benz, fascinating concept cars to Pikes Peak runners and F1 cars. Forza finally drew even with Sony when FM4 featured 671 cars including all the DLCs. Adding to that, the quality was far better, including a detailed cockpit view and a detailed model of the car's body for every car, not a two-class system as introduced since GT5. Take a look at the numbers: a Shift 2 model for example consists of about 65k polys, while a FM4 model is about three times that or more (speaking of the highest available Level of Detail). Then Forza 5 came along, first showing video scenes of great graphical value. A McLaren P1 racing through downtown Prague. All very nice and well, but not really revealing. What was shocking was the amount of cars available from the start: 213, including Limited Edition and VIP cars. Sure, right now a whole lot of DLCs brought the count up to 314 again, but still, currently FM5 is offering less than half the amount of cars as its predecessors. And for what? For engine bays, detailed exhaust tips and thoroughly replicated hood straps. Don't get me wrong, that attention to detail is impressive. But what is it good for in a racing game that takes place predominantly on closed circuits? Look, there is a feature that allows players to paint the engine bay of the R34 Skyline. Nice. Can you actually see the engine bay? No, unless you crash off the hood first or prefer to look at it in the studio mode. It's a work intensive feature to implement that is limited in terms of usability. And is that kind of knick-knacks worth dropping half the car selection? Or take a look at this promotional picture, showcasing hood straps of a Pagani Huayra. Fascinating, definitely. But how long, and how often, would you start your X-Box and say "huh, I'm lusting for some action – thank god I can zoom in on the leather strap to take it in in all its glory."? It's a nice thing to do precisely once and the second time to show it to your non-believing friend, but ultimately, when it comes to racing a great car on wonderful roads, the difference between a nicely textured or a laser scanned, high poly bolt on an engine cover becomes marginal. 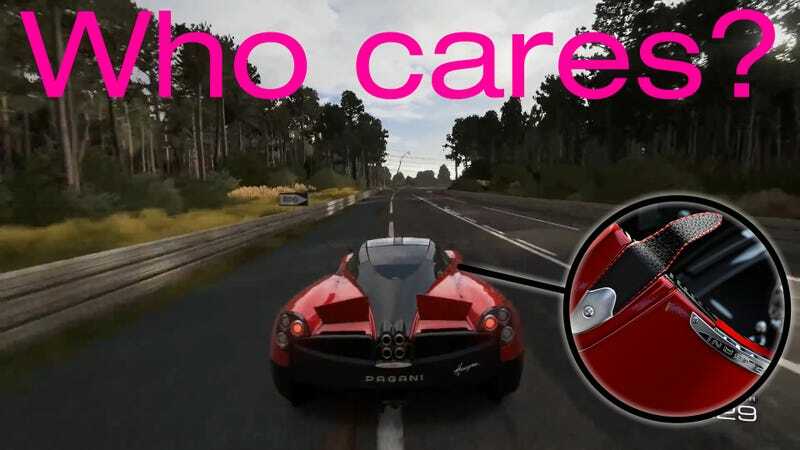 A game in which I would totally understand this new approach is Forza Motorsport 5's open world cousin and spiritual TDU2 successor: Forza Horizon 2. Forza Horizon 2 Makes me remember Test Drive Unlimited 2.. In TDU and TDU2, driving around the islands of Ibiza and Hawaii online was a great opportunity to present one's personal favorite vehicle, be it a bike, a muscle car or Europe's finest exotic machinery. Color, trim and wheels could be varied for individualization. And here, insane details start making an impact if they allow for custom work. Speedhunters has described numerous times how important the little touches are on the show aspect as they finish off a certain look and set cars apart. At this point, virtually taking the car out for a cruise evolves into a proper show run in which everyone can take inspiration and admire a player's passion to a specific vehicle style. Meanwhile, beautifully modeled tow straps in FM5 rot mostly in ignorance, because let's face it: when attacking a difficult circuit in full tilt, perfect details aren't necessary, and the action out on track is what Forza 5 is about. What's your opinion on this? Is the reduction in vehicles combined with the new details just the logic start of the Next-Gen racing games? Or do you also see the obsession with detail as unhealthy if the diversity is sacrificed in return? Feel free to express your opinion in the comments.